We strive to make all of our clients, existing or brand new, feel at home when they walk through the door. Beginning with the consultation, our staff always listens to your needs and pays full attention to your wishes. A full service salon, excelling in color, color correction, foiling, highlights and lowlights, precision cutting and design perming, Local Motion also offers hair removal and air brush makeup. We can also give you that new look with our wide assortment of add on hair pieces! We consider education a vital aspect of our business. 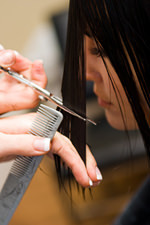 With that in mind, our staff attends seminars and classes on a regular basis, ensuring that we are always in touch with all of the newest trends, styles and techniques. Whether it’s technical, hands on or motivational, we are fully aware that education makes a difference! And with this knowledge, we are able to serve you to our maximum potential! Call us today at 724-482-2939! Local Motion Hair Design… where change comes naturally!